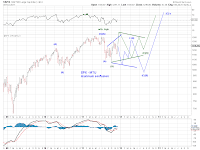 A bullish triangle (green, contracting) and a bearish triangle (blue, expanding) for maximum confusion (whipsaw). 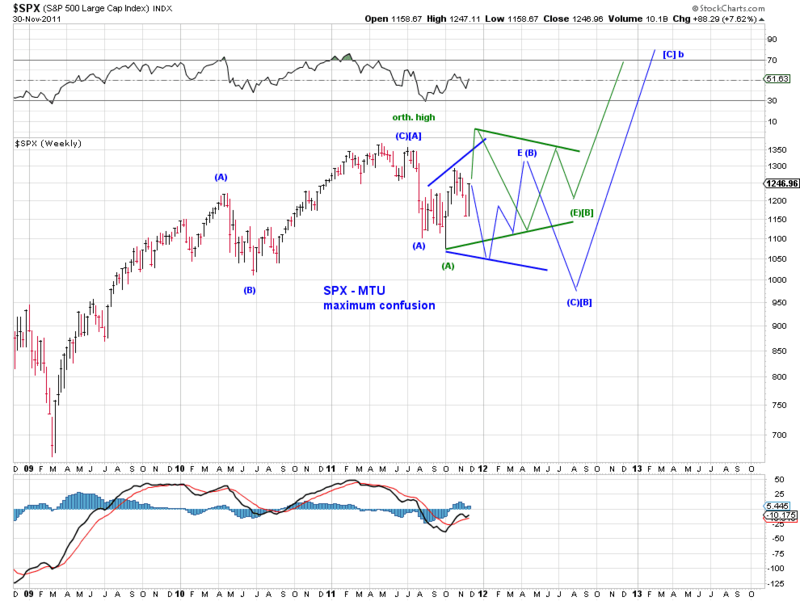 Note that the July high likely holds for the bearish-blue triangle, but new highs likely for the bullish-green triangle. Waves for thought. 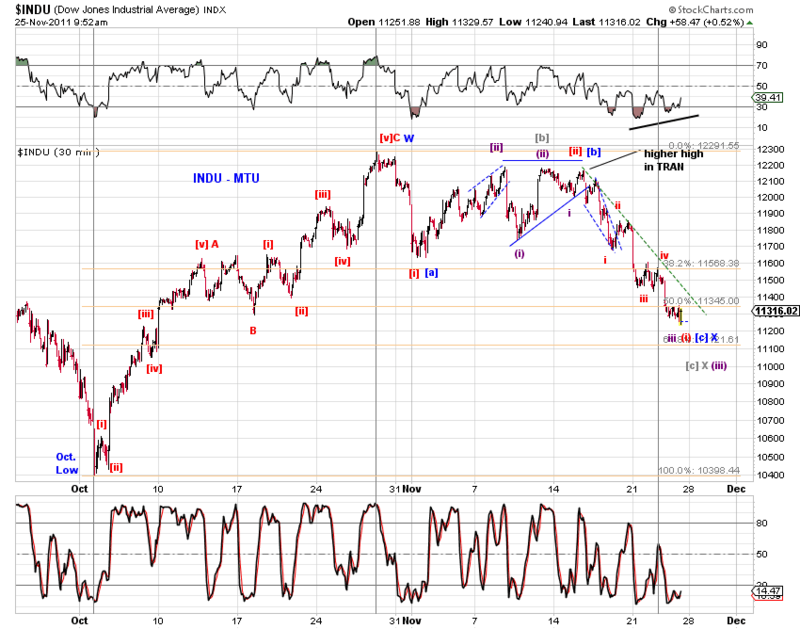 See 330pm entry below - with this updated chart. Today's surge is a "small-degree" 3rd wave or a C wave. Here's how it might fit into the larger count. 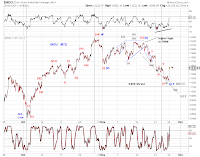 bullish (blue) - to push above the Oct. high to at least complete a counter trend rebound against a visual five-down from the Apr/May top ... with potential to be part of a larger 3rd wave to new highs. 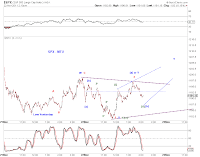 (a - purple main) to complete wave D-up of an ED-type wave (C)-down, likely to below the Oct low. 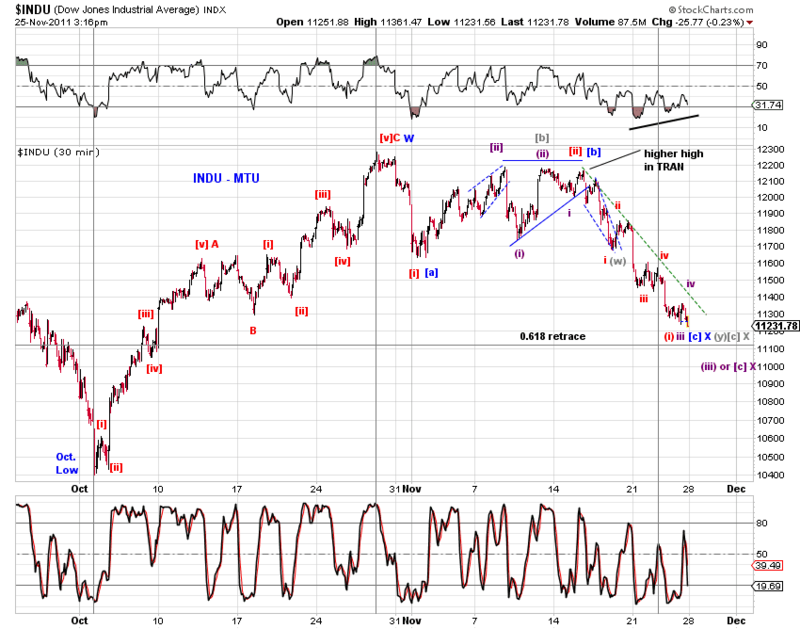 Rising above the Nov high invalidates. 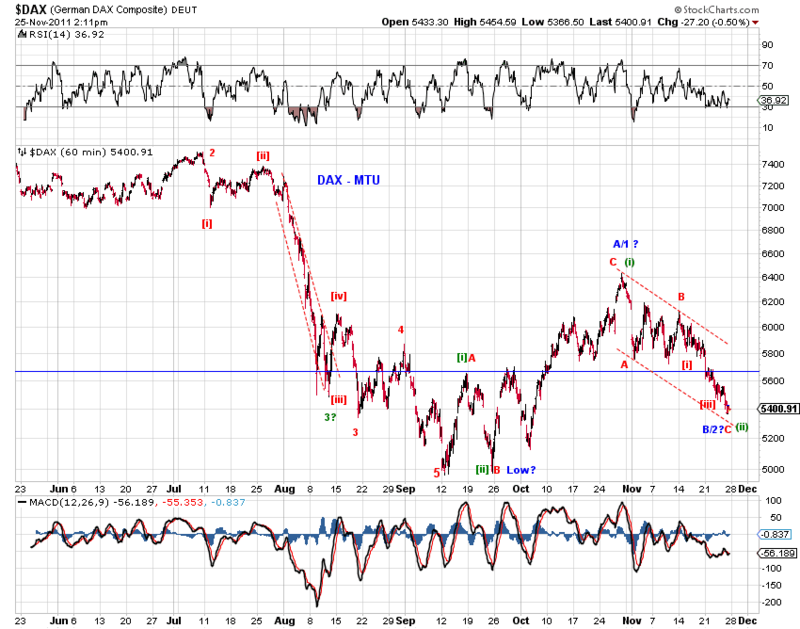 (b - purple alt) to complete wave [ii] rebound against the decline from the mid-Nov orthodox rebound top. Rising above the Nov high invalidates. 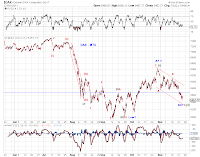 (c - red) to complete wave X-up of (Y)-down, likely to below the Oct low. 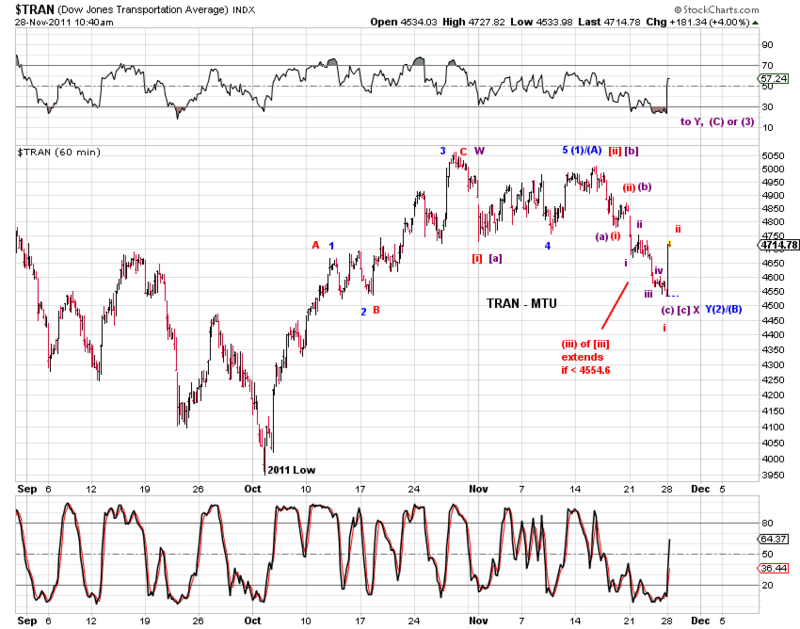 Rising above the Oct high invalidates. Month End. The pre-market surge pushed ES to its 50D-MA. 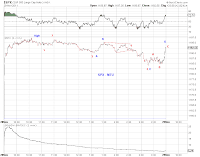 The pre-market surge is likely wave (v)-up (end of [i]-up) or wave [iii]/C-up based on squiggles. ES triangle broke downward in AH trading (Chart 1). 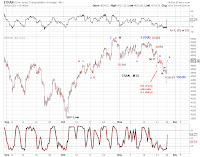 Chart 2 updates tracking counts on SPX. 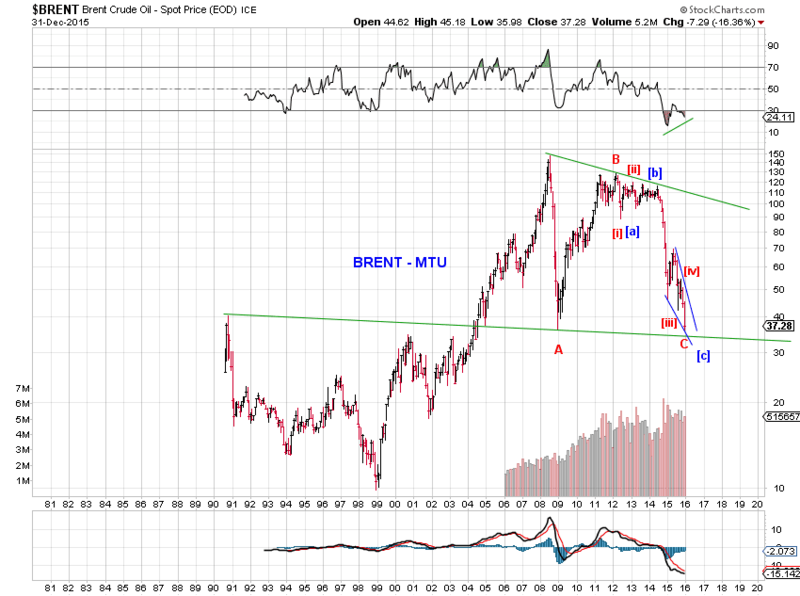 Let's see if it is a bearish or bullish triangle or not even a triangle. 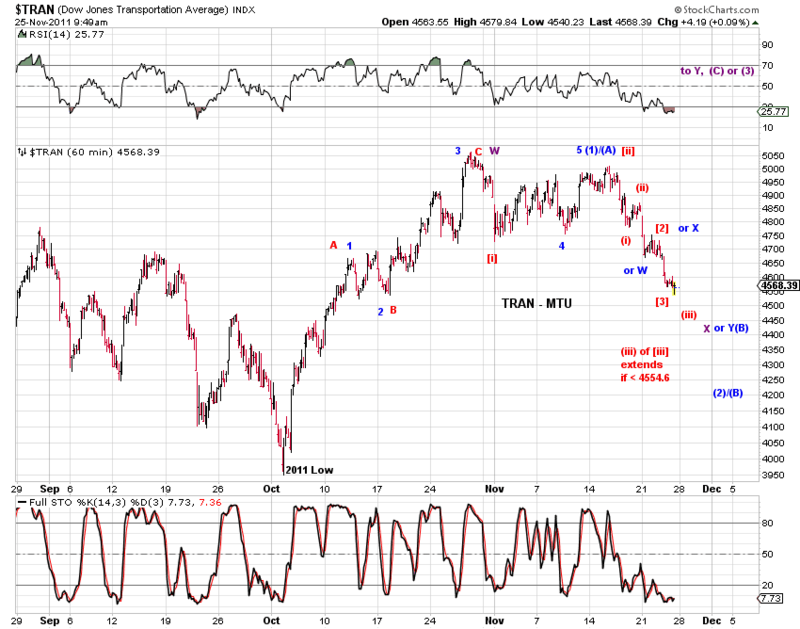 "1/4" overlap at various degrees in TRAN, but not in SPX - bullish on balance. However, leave room for a five-down in SPX (red as marked) and an LD-down in TRAN, under the bearish interpretation. DAX/CAC (and to a lesser extent FTSE) experienced major overlap which eliminates the rebound being a 4th wave at any degree. 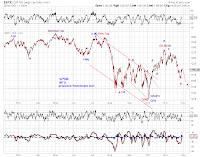 Thus, odds continue to shift towards bullish counts for European benchmarks. 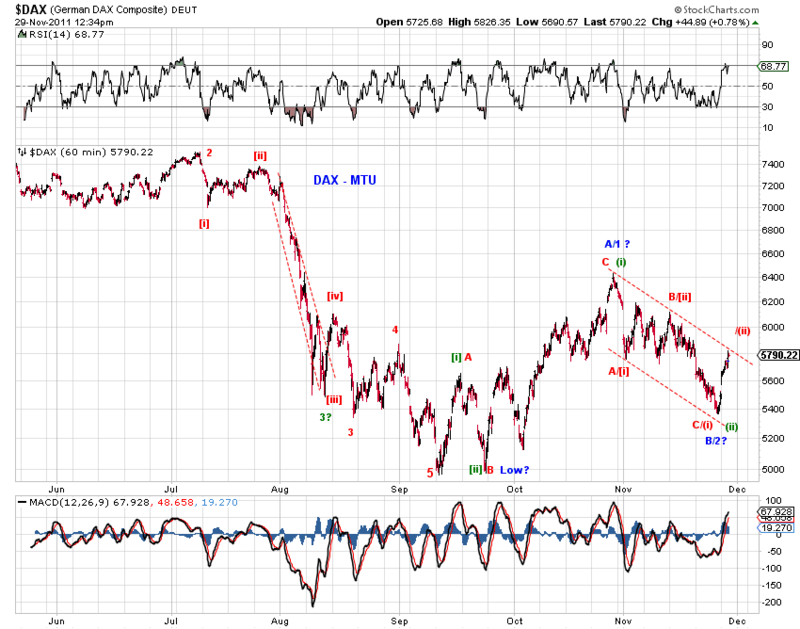 Both DAX and ES are now at the upper channel resistance. Reaction here will be telling. In addition, ES is approaching is 50D MA - see big picture chart to the right. 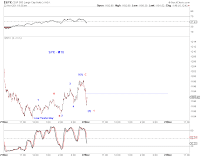 ES has 7 waves up from the nominal low. 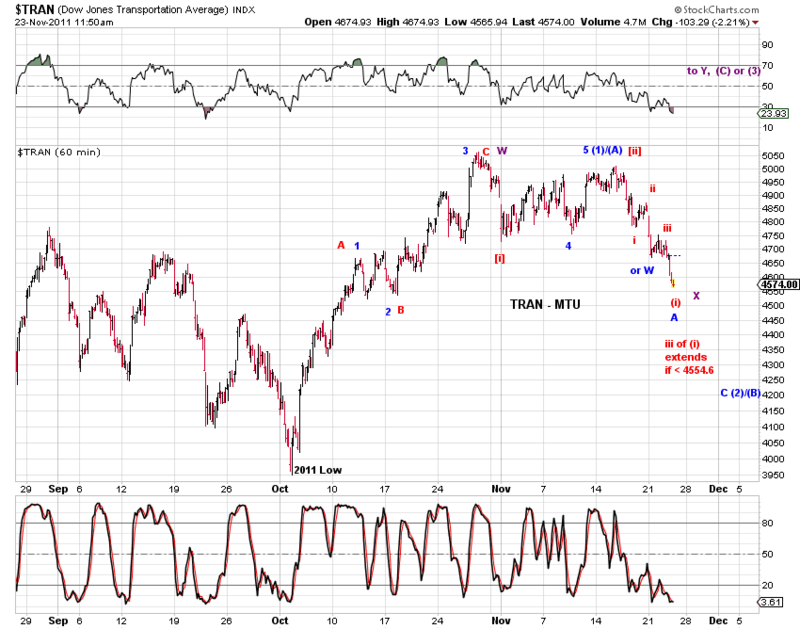 Bullish count in blue. 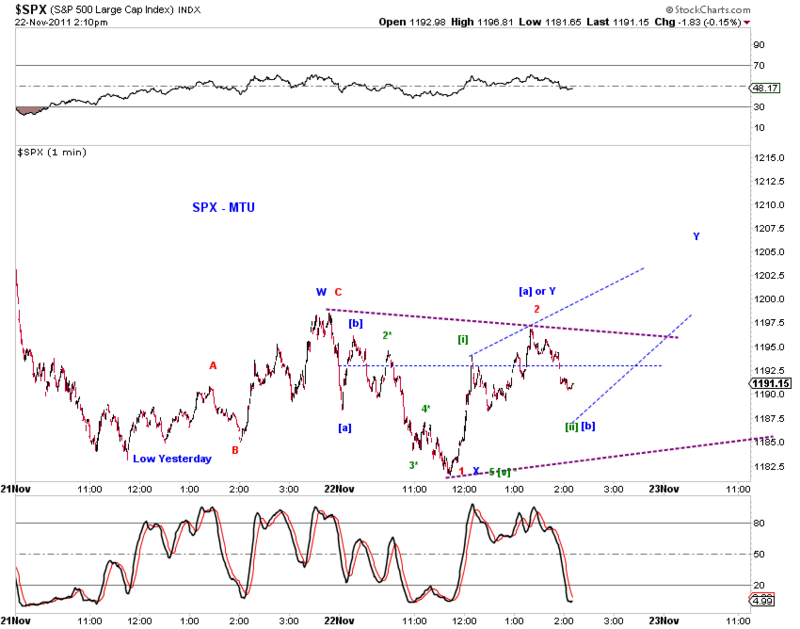 Added the purple count to accommodate the rebound being a 4th wave at an even higher degree. Unlike stocks, no higher high in Gold, nor in Oil. Based on ES, the surge from its low is a visual five-up (Chart 1, blue), although a zigzag wave [iv] may just ended at the 0.382 fib if ES experienced a truncation (Chart 1, red) which is not unreasonable given the shortened Thanksgiving sessions. Based on SPX, the decline from today's high is not conclusively actionary (Chart 2, blue), although it could very well be (Chart 2, red). 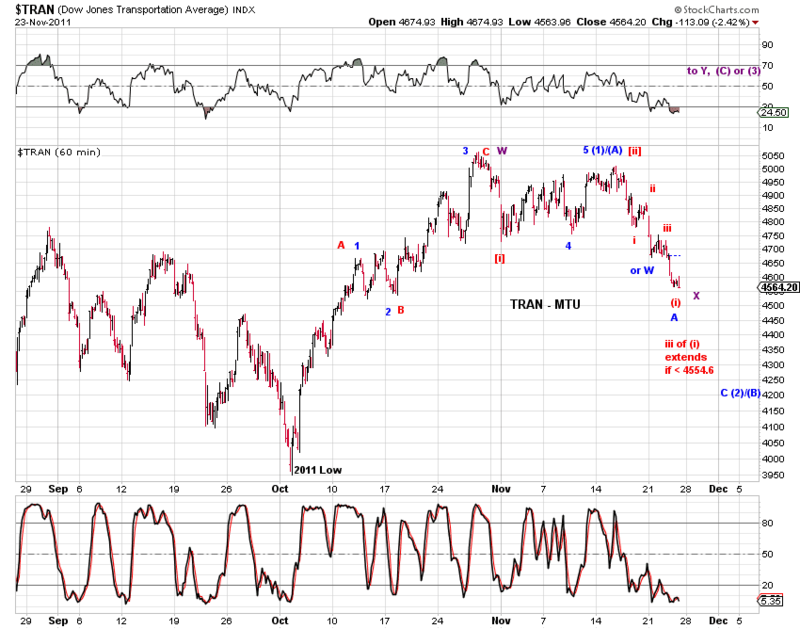 Based on Transports, the decline from the most recent nominal high is 7 waves (Chart 3, and 1040am entry) - unless a pretty extended 3rd wave (Chart 3 red) is in play. On balance, odds favor the bullish count, with at least one more push higher, and perhaps with potential to eventually surpass the Oct high. 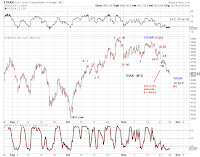 For the very near term, the decline from today's high could use another leg down, as C-down of a corrective structure or (iii)-down if today's high is indeed a wave [iv] top. 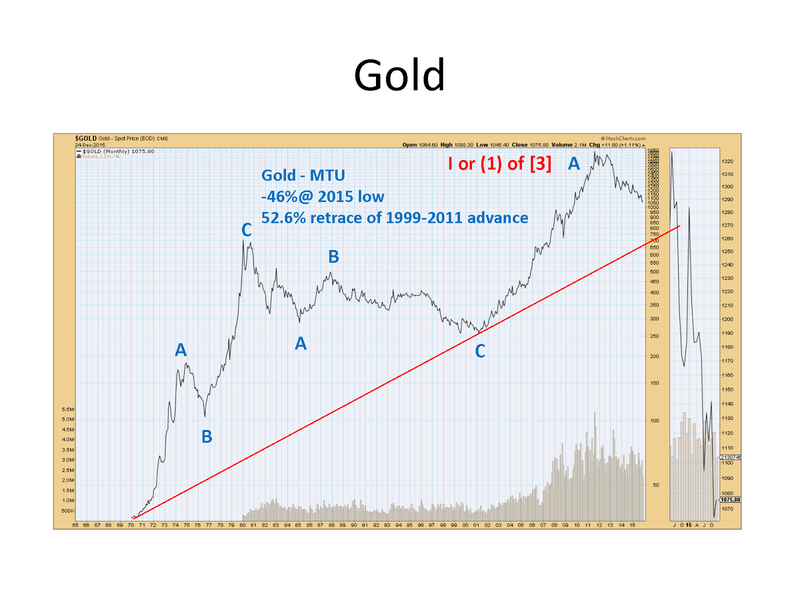 The bearish possibility of a wave [iv] top is more easily seen in the wave structure of GOLD (Chart 4). Wave structure in transports (Chart 1) favor the bullish view (purple or black)given that there are 7 waves down from the most recent nominal high - unless a pretty extended 3rd wave (red) is in play. Bumping the the rebound one degree higher by employing a truncated fifth - better form - as another possibility. 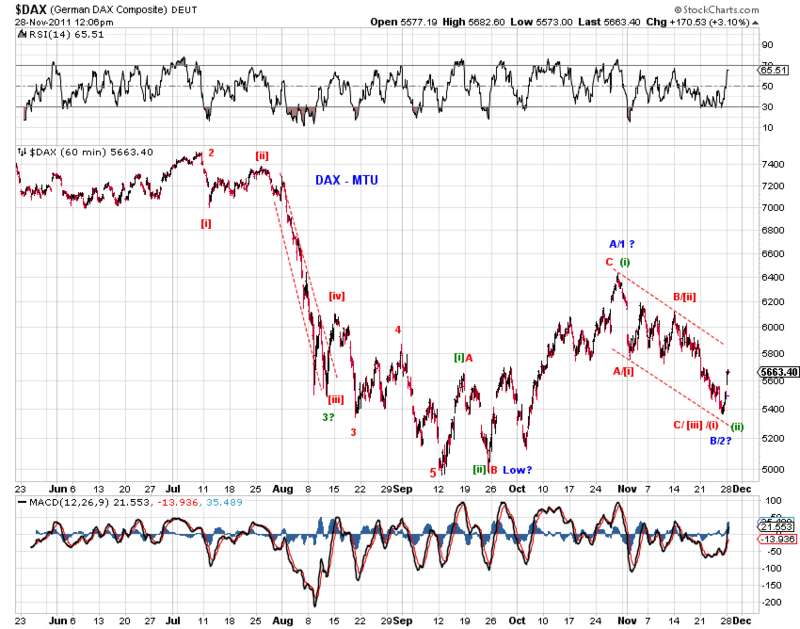 Bull count is unchanged. See the 620am entry for more. 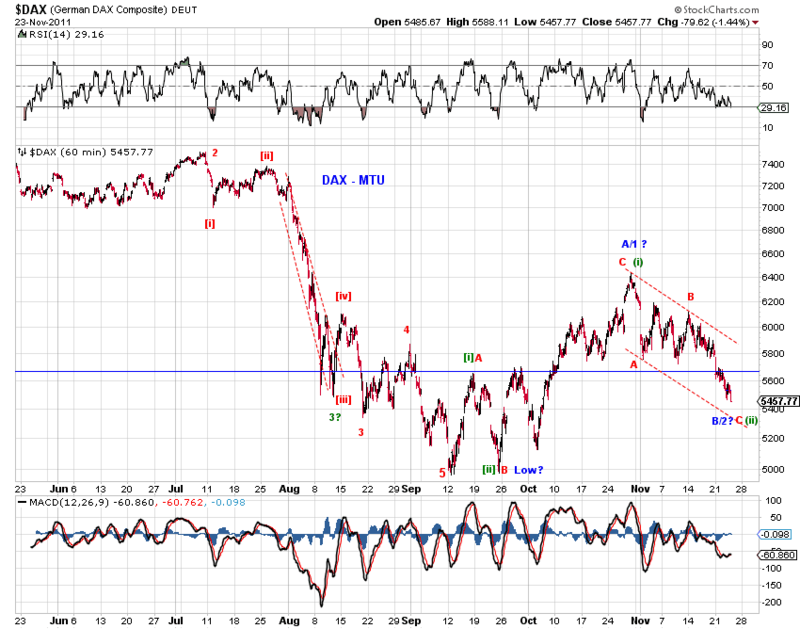 DAX / FTSE - nice-looking ABC November decline , look for 1/4 overlap for confirmation. ES - A visual five-up in place at the moment. See Sunday night update (below) for discussion. It's amazing sometimes how waves eventually unfold and clarify themselves. See Chart. 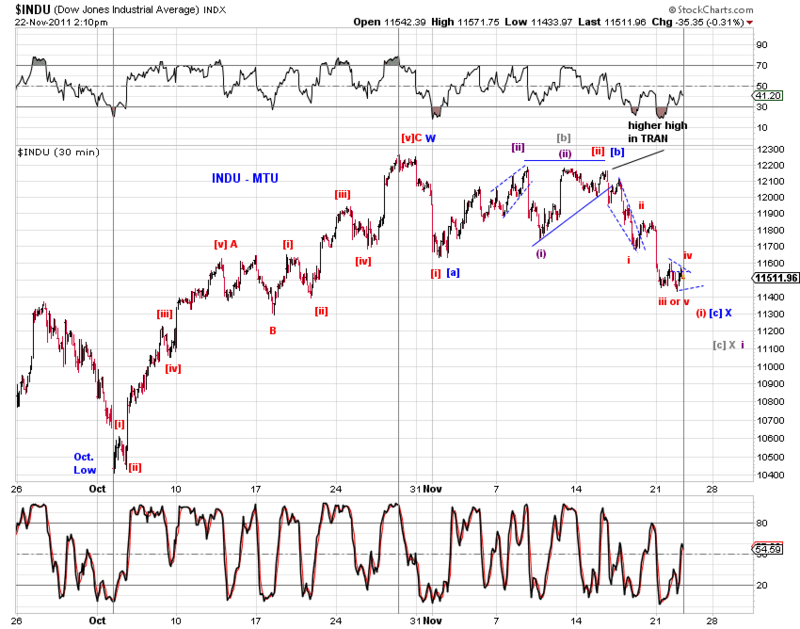 If BOTH the large triangle and the small triangle as marked are valid, odds now favor the bullish count (BLUE, i.e. moving at least above the Oct high). If only the small triangle as marked is valid, the tug of war between the bulls and the bears continues and odds favor at least one more low (RED and Alt-Blue). 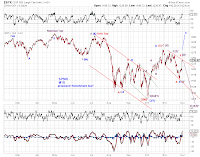 Note that the Sunday night gap up has at the moment stalled at the implied (ii)-(iv) channel line. We'll see what transpires overnight. P.S. With the Sunday night's gap up in stocks, there is, at the moment, no breakdown in EURUSD, no breakout in DX, no breakout in U.S. bonds, all at the brink of doing so. The November sell-off in stocks has now become orderly enough for one to narrow down top counts and identify (at least local) turning points. See charts. In addition, stocks have retraced around the Fib-0.618 of the October advance. 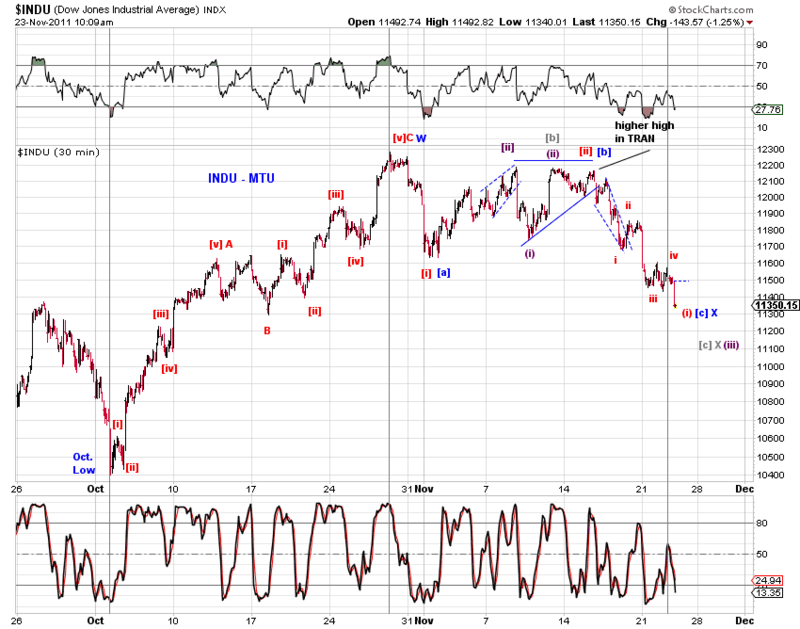 This is the first major correction of the October advance - if it is one. See Keep it Simple (11/18/11) for big picture tracking. INDU/SPX is in a similar spot as the two main ES options - wave iv (purple) rebound or impulse complete at the low (red, blue) (Chart 1). However, if one sticks to Precther's EWP strictly - wave 3 never the shortest - waves in Transports suggest an extended 3rd wave or a double zigzag yet to complete (Chart 2). The red  in chart 2 should read i, ii, iii to make the degree consistent. 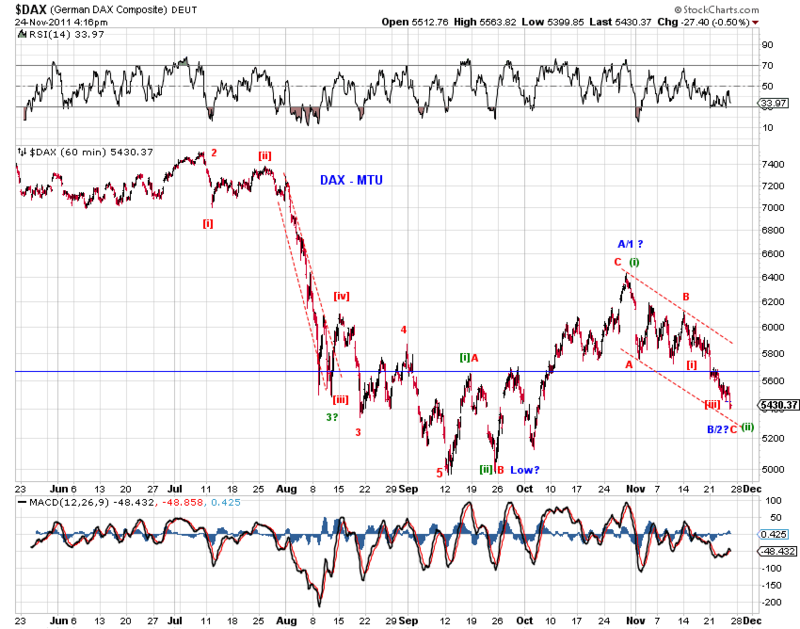 INDU/SPX is not subject to this dilemma. While it is possible the decline in INDU from the nominal high (gray) is a completed double zigzag or a completed five-down (blue, red),it's prudent to leave room for at least one more down swing. ES - At the moment, "endless" extension makes 9 waves down from the black B and 7 waves down from the green B, and 11 waves down from the nominal high of 1272.25. This decline is where benefits of not rushing the wave count show. 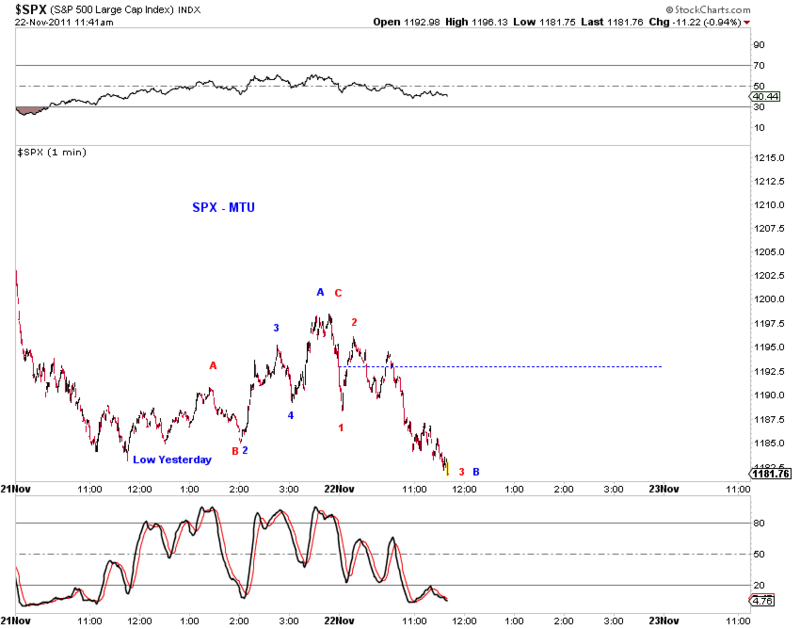 Lower low in both, after a 4th wave (see black count below) rebound in ES. ES rebounding in quite overnight trading and has recovered about 50% of Wednesday's decline at the moment (Chart 1). Chart 2 offers a larger count. 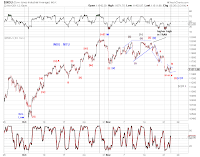 See Wednesday's EOD update for details. Stocks have a shot at at least a local local (end of five-down from the Nov high) as evidenced by Chart 1 (transports) and Chart 2 (ES, green). 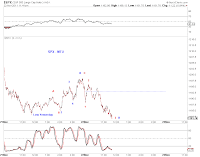 Chart 3 shows how a decent sell-off into the close today may be the "final" small degree fifth wave. Note that the low in ES ended at the mid-channel line. 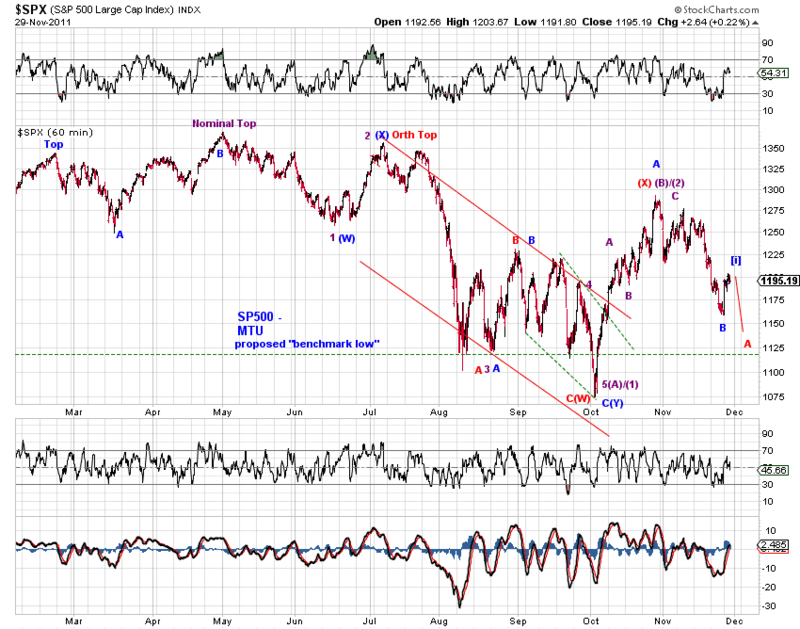 The near term low is the low based on the green count. The black count has (iv)-up and (v)-down yet to come. 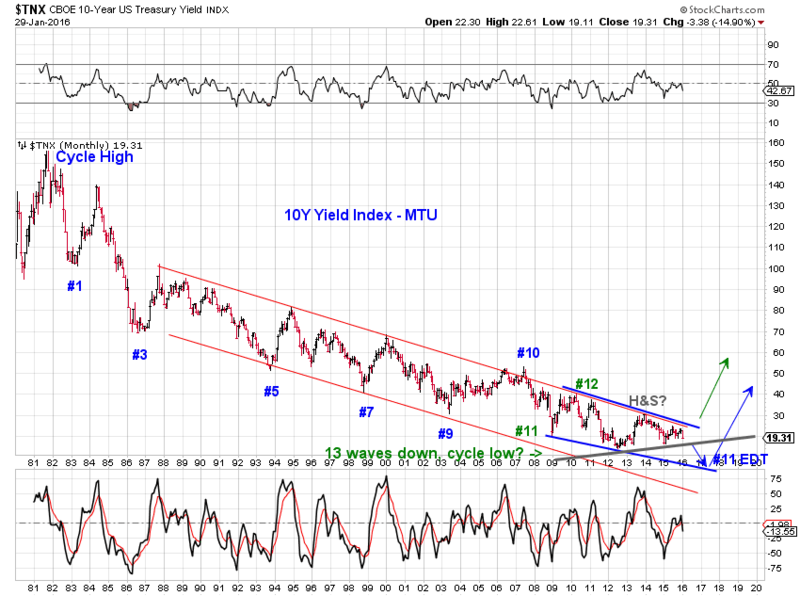 It is informative to keep an eye on the larger picture (Chart 4). ES has retraced near 0.618 fib of its Oct. advance. No hint of intermediate term direction yet. Directions? yes. See big picture scenarios in Keep it simple (11/18/11). All the best to those who observe the Thanksgiving holiday. And best wishes for the rest too. Green - low is likely in. DAX closed at its low of the day. Look to transports for clarity. 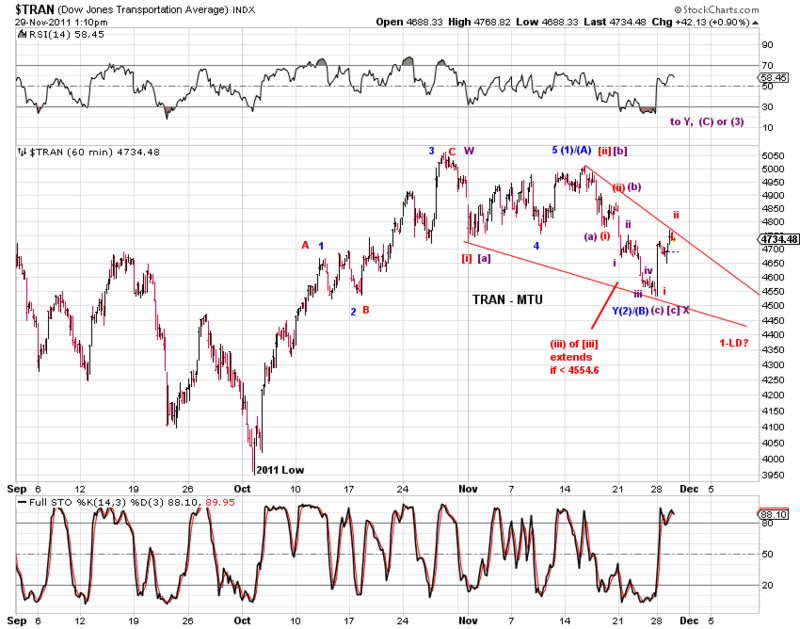 Small degree 3rd wave should extend if TRAN drops below 4554.60 (current low 4565.94). Otherwise a bounce, at least. See 2nd chart below. ES retraced more than 50% Fib. Keep an eye on the bigger picture. Squiggle-wise, role-reversal. 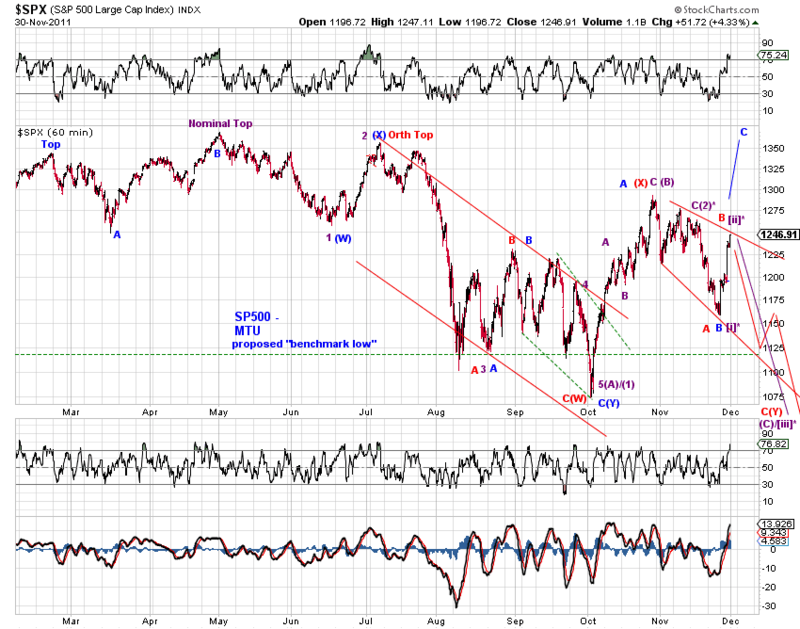 The overnight low likely completed the green impulse down. 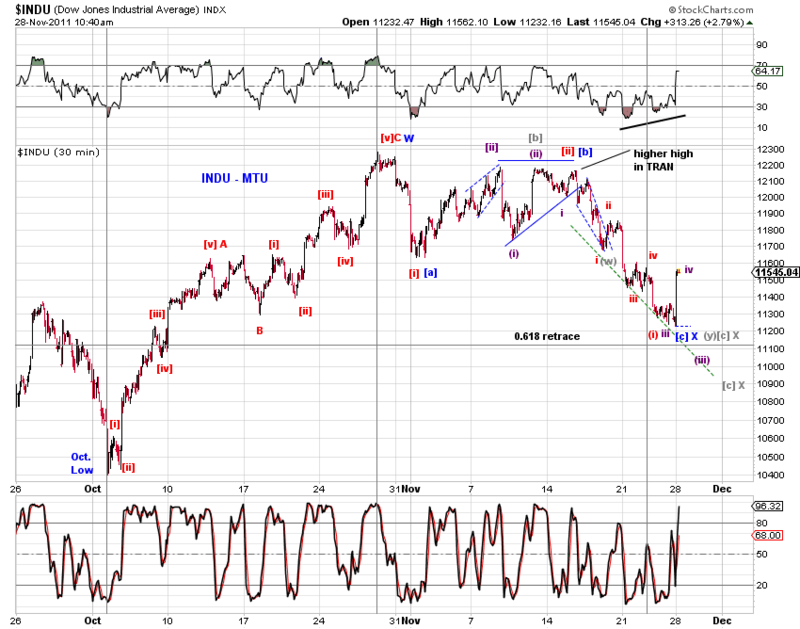 But the green impulse down with an extended [v] is likely missing a final thrust. 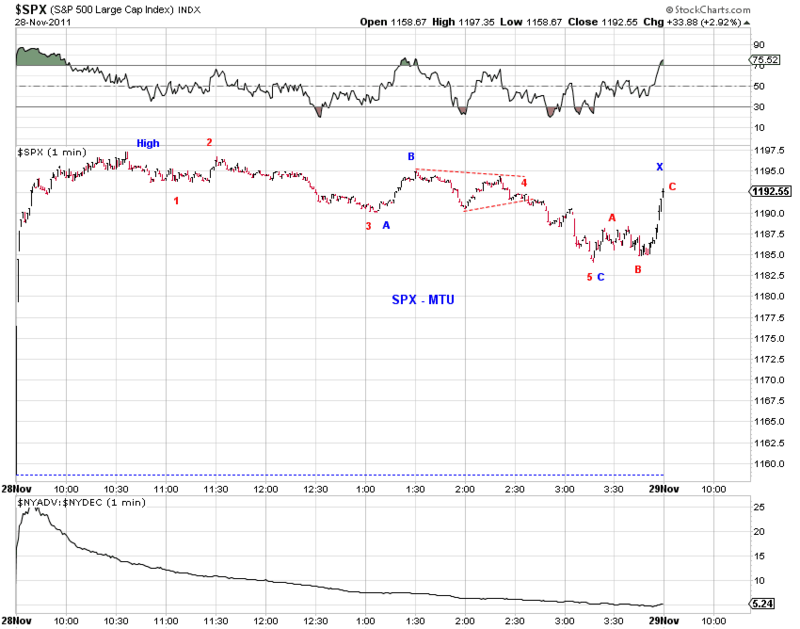 Decent-sized sell-off during after hours, but no lower low yet. 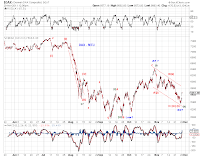 Perhaps the potential triangle highlighted in the 210pm entry panned out, or wave -down of v-down is already in progress (Chart 1). At the same time, it's entirely possible that today's low is the low based on the black count on ES (Chart 2). 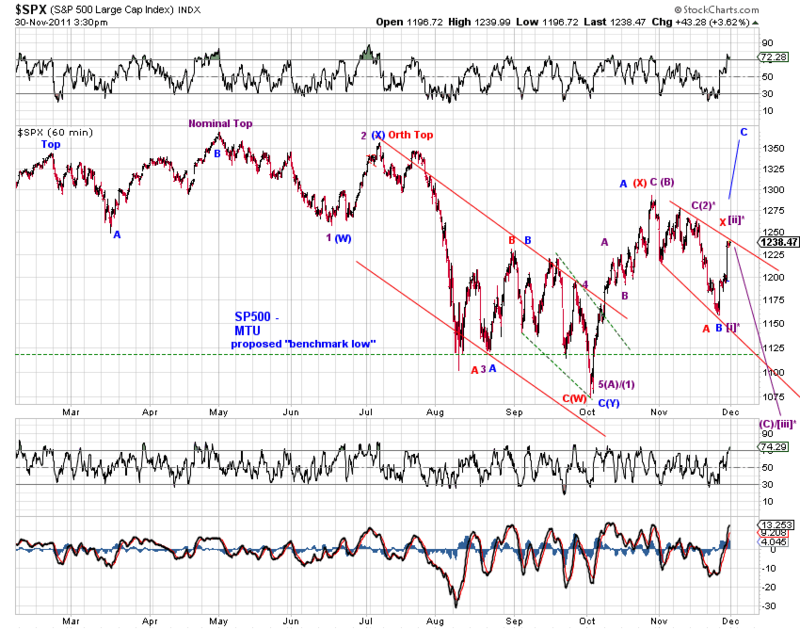 Hard to rule out a small-degree 4th wave still in progress, despite the lower low today. Various tracking counts. SPX - expanded flat or wave [v]-down. 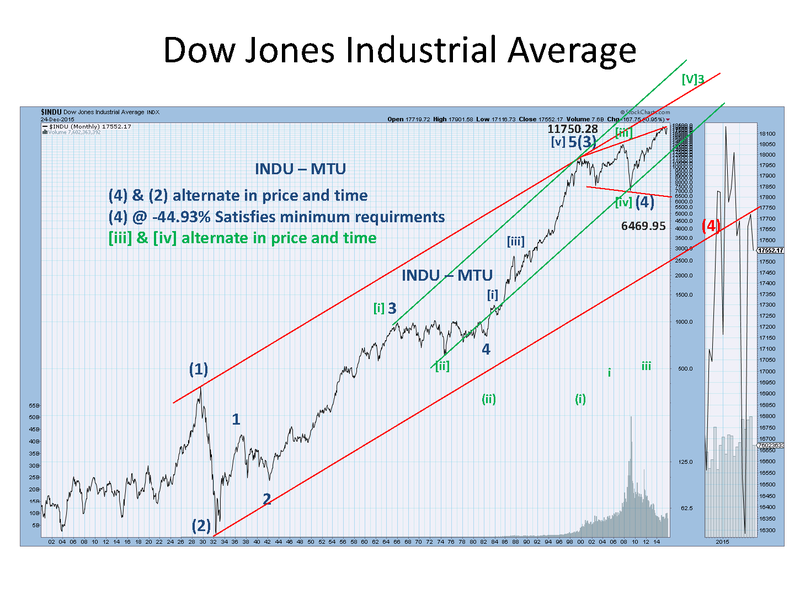 Post-GDP, potential expanded triangle connecting wave. We'll see if it is. 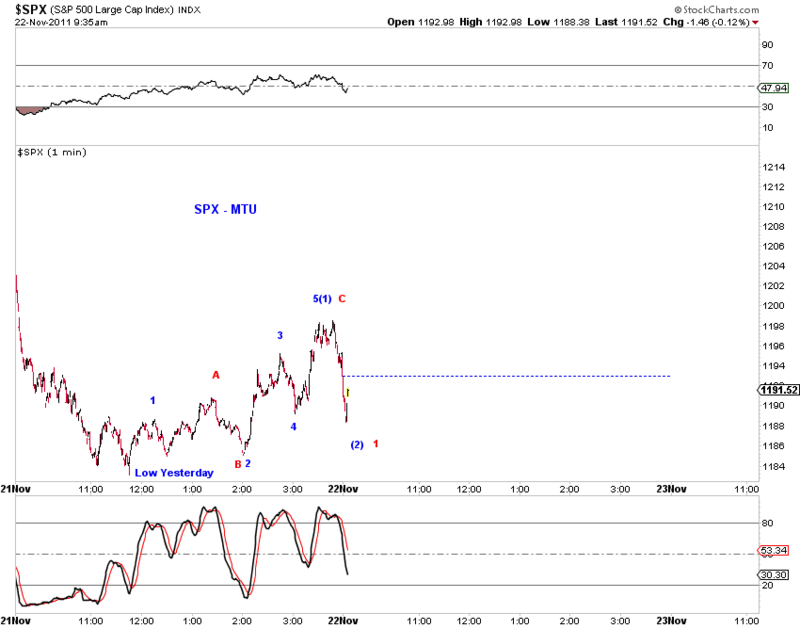 ES - One more lower low based on the green count. Correction done or a deeper 2nd wave rebound based on the black count. 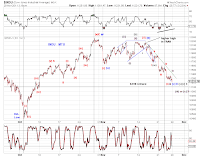 The chart to the right shows potential squiggle counts.